Call Boat Owner Roger 205-310-0233. BOAT OWNER'S NOTES for 1995 CARVER Voyager 320 w/twin Crusader 350 XL gas engines in VERY GOOD condition, call Roger @ 205-310-0233. 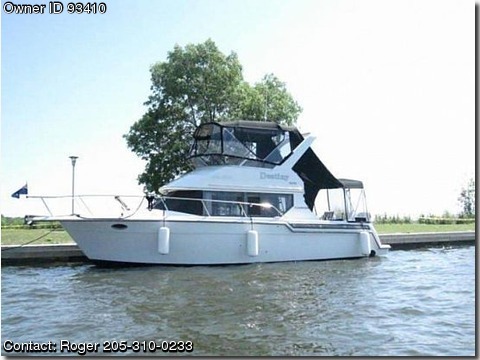 I am the 2nd owner, This vessel has “looped” the mid-US, and through the Great Lakes, Very dependable and a great all around vessel for live aboard, fun recreational use and short excursions for comfortable overnight stays. FEATURES: Display gauges on fly bridge and in salon down below, Has map card reader in fly bridge, and marine radio, Easy access double-battery charger in salon area, Open design and extensive seating in cabin area, and with 2 bench seats on fly bridge, in addition to captain’s chair, Walk around bow with chrome hand holds, Aft davits for easy dingy storage and release, Aft storage cabinet and shower, Fresh water moored, Swim ladder off aft extension along with tuna door, Cruising speed 22 kph, with max speed 37 kph, Engines register with 700 hours each. LAYOUT: Has upper helm flying bridge and lower helm in salon, New canvas surrounds flying bridge, along with new window covers all around lower quarters, One stateroom with large bed, side windows, port window with screen, and 2 lockers, Full bath amenities with shower-capable, Storage areas through the boat, Kitchen area (Galley) has refrigerator, sink, microwave, and electric/gas stove, Electrical panel in salon with cover, Radio with stereo speakers. BOAT NOTES: Two 80 gallon stainless steel gasoline tanks, with fiberglass water and waste storage tanks, Anti-fouling paint applied in 2011, Currently with all cabin cloth material and carpet removed for redo.